An international peer-reviewed journal publishing high quality research and review articles on all aspects of Nursing Science and Research, Midwifery, Nursing management, Care planning, Community and Home Care, Critical Care & Pediatric Nursing, Preoperative Nursing, Geriatric Nursing, Surgical Nursing, Assessment and Diagnosis and miscellaneous topics in Nursing. Abbreviated Title: Int. J. Midwifery Nurs. Pract. International Journal of Midwifery and Nursing Practice (IJMNP) is a member of the International Committee of Medical Journal Editors (ICMJE) and follows its recommendations. 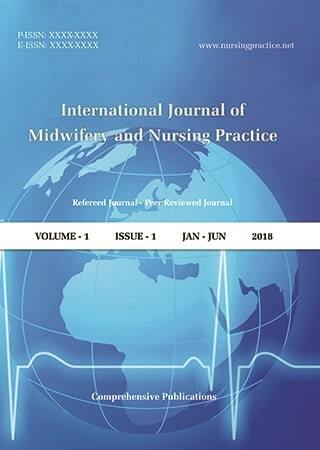 We invite you all to contribute to the International Journal of Midwifery and Nursing Practice (IJMNP). Online submission of the manuscript is strongly recommended. A manuscript number will be mailed to the corresponding author within one week or earlier. Prospective authors can submit their manuscripts at nursingpublication@gmail.com. Read Instructions to Author for more details. All manuscripts are subjected to peer review process (which are not previously published and are not under consideration for publication by another journal) would be published without any delay in a subsequent issue after acceptance.